On-site nitrogen generation can be a cost-effective option for a wide range of purity and flow requirements. Nitrogen gas is a staple in the chemical process industries (CPI). Because it is inert, it is suitable for a wide range of applications in manufacturing, processing, handling, and shipping. Nitrogen is often used as a blanketing and purging gas to protect valuable products from contaminants. It enables flammable materials to be safely stored, and it can protect against combustible dust explosions. Nitrogen gas is also used to remove contaminants from process streams through stripping and sparging. The widespread use of nitrogen in the CPI has driven nitrogen production and supply methods to become more reliable, efficient, cost-effective, and convenient. 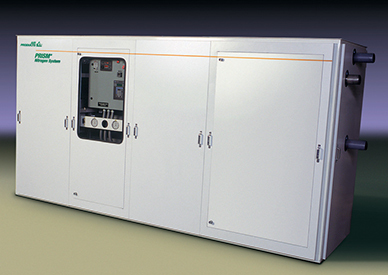 Multiple nitrogen technologies and supply modes are available to meet a variety of requirements, including purity, usage pattern, portability, and footprint. Choosing the optimal supply option, however, can be a challenge. 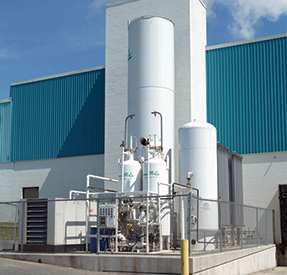 Producing nitrogen gas on-site is a proven and cost-effective option for a wide range of flow and purity requirements. These generators use either noncryogenic separation processes, such as membrane permeation and pressure swing adsorption, or cryogenic processes, which rely on very low temperatures to separate nitrogen from compressed air (Figure 1). ▲Figure 1. Nitrogen users can choose from a range of options for on-site nitrogen production to meet a variety of needs, including cryogenic air separation (top left), pressure swing adsorption (top right), and membrane systems (bottom). 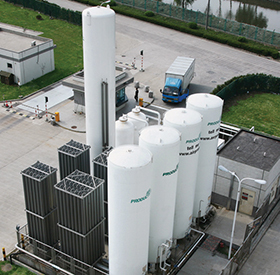 Industrial nitrogen gas is produced by cryogenic fractional distillation of liquefied air, separation of gaseous air by adsorption, or permeation through membranes. Cryogenic distillation of air is the oldest method of nitrogen production and was developed in 1895 (1). The concept of producing and selling industrial gases on-site was introduced in the early 1940s (2). These cryogenic plants were built on or near a customer’s site and the product was delivered via a pipeline. This method allowed customers that required large volumes of gases to significantly reduce product costs while enhancing raw material reliability. The relatively high capital and power costs associated with on-site cryogenic plants, however, limited users of smaller volumes to liquid nitrogen delivered by vacuum-insulated trucks. The nitrogen was stored on-site and then vaporized and piped to the point of use as needed. The 1980s ushered in alternative methods of on-site generation, including pressure swing adsorption (PSA) and membrane separation. PSA systems operate on the principle of adsorption, whereas membrane systems rely on selective permeation. Early system designs produced nitrogen that was suitable mostly for small-volume, low-purity requirements. PSA and membrane systems have since improved and can now meet a range of volume, purity, and usage requirements. Cryogenic nitrogen generation. 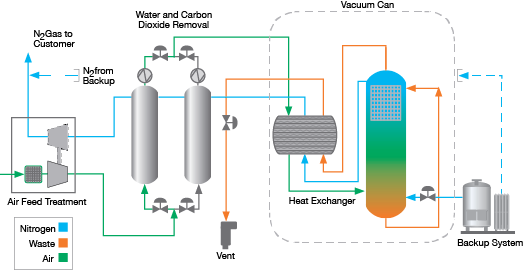 Cryogenic air separation systems (Figure 2) compress atmospheric air in the main air compressor and then cool and treat the air to remove water vapor, carbon dioxide, and hydrocarbons. In the vacuum can, a heat exchanger cools and partially liquefies the air, which then passes into the distillation column, where the mixture is separated into nitrogen gas and an oxygen-enriched waste liquid. A small amount of liquid nitrogen may be injected or an expander installed to provide additional cooling. The nitrogen gas then flows into the supply line to downstream applications; the product may be compressed to meet pressure requirements. Robert Lewis is a marketing manager in the corporate development organization at Air Products (7201 Hamilton Blvd., Allentown, PA 18195; Phone: (610) 481-4929; Email: lewisrl@airproducts.com). He holds a BS in business and an MBA from the Univ. of Maryland. Timothy Lebrecht is the industry manager of chemicals, refining, water, and cryogenic applications at Air Products (7201 Hamilton Blvd., Allentown, PA 18195; Phone: (610) 481-8388; Email: lebrectd@airproducts.com), where he is responsible for commercial technology and development for the chemicals, refining, and water treatment markets. He holds a BS in chemical engineering from Purdue Univ. and an MBA from Lehigh Univ. More in "Back To Basics"